How Is The Shutdown Affecting America? Let Us Count The Ways From TSA agents and Coast Guard personnel, to climate researchers and artists, the lives and work of many Americans are being complicated by the ongoing partial government shutdown. 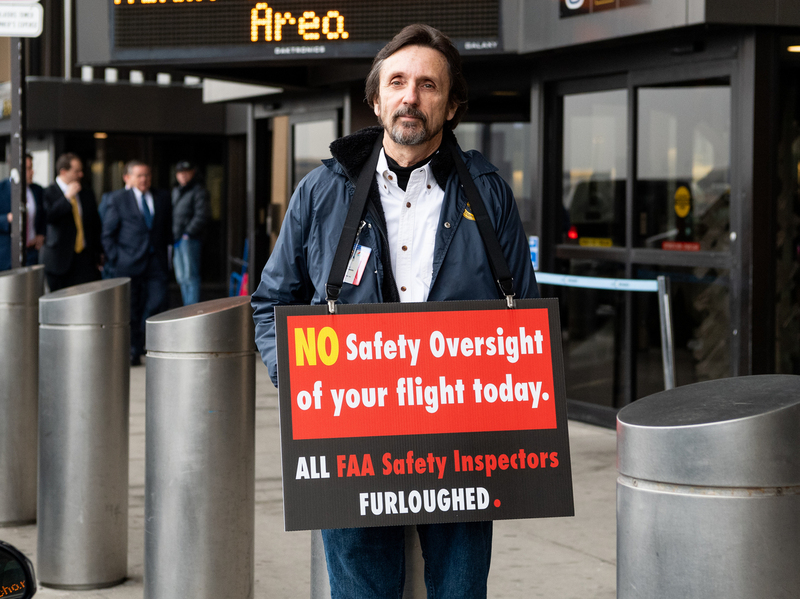 A man holds a placard at Newark Liberty International Airport on Tuesday, reminding travelers that FAA safety inspectors have been furloughed during the shutdown. The U.S. government has been operating under a partial shutdown since Dec. 22. The shutdown, driven by a political battle over President Trump's demand that Congress approve funds for a wall along the border with Mexico, is touching the lives of Americans in myriad ways. Nine federal departments (and some smaller agencies like NASA) are affected, at least in part, by the lapse in funding: Agriculture, Commerce, Justice, Homeland Security, Housing and Urban Development, Interior, State, Transportation and the Treasury. Approximately 800,000 federal workers have been furloughed or are being required to work without pay. Congress had already passed appropriations bills funding about three-quarters of the federal government, including Health and Human Services and Veterans Affairs, so those departments and agencies remain operational. Lots of important things are not affected by this shutdown: Medicare, Medicaid, and the Health Insurance Marketplace (aka Obamacare). Social Security, disability checks and veterans' benefits. Getting a passport. And the U.S. Postal Service, an independent agency whose operations are funded by sales of postage and services, not taxes, keeps delivering mail. But other aspects of American life have become complicated, scarce or messy since the shutdown started. Here's a look at how it's affecting the country. The Transportation Security Administration is part of the Department of Homeland Security. Many of its workers are considered "essential," so many are working without pay — though a greater number than usual have been calling in sick. So far, lines at airport security have not been significantly longer. TSA employees are among the lowest-paid federal workers. "If there's no check on the 26th, I have no idea what we're going to do," 36-year-old Jacinda, whose husband is a TSA officer in Portland, told NPR. "Our rent is due, the electric bill is due, our cellphones are now past due. ... I'm scared and I'm trying to be OK because I can't be sad every day for my kids, and I can't be stressed out because it affects how I parent." She said her husband is stressed out too — and that he has been given instructions on how to file for unemployment, though he's still working 40 hours a week. Also affected: air traffic controllers, who are working unpaid. "It's a very high-stress job and you need to be on your game at all times," says Mick Devine of the National Air Traffic Controllers Association. "There is a concern that as this goes on, the human factors aspect of this shutdown will take a toll on the psyche and concentration level of our members." Many planes are not being inspected and pilot training is not being certified, says Capt. Dennis Tajer, a pilot for American Airlines and a spokesman for the Allied Pilots Association. That's because many of the FAA safety inspectors aren't working. "We are able to maintain a margin of safety and security, but every day another player is pulled off the field and it comes some point where the game cannot be played properly," Tajer told NPR. "We are another layer of safety," inspector Troy Tomey told the Miami Herald. "We're the last check of the box. Taking us out of it, mistakes can happen." The U.S. Food and Drug Administration furloughed about 40 percent of its staff since the government shutdown. FDA Commissioner Scott Gottlieb said that the agency has suspended all routine inspections of food processing facilities in the U.S., The Washington Post reports. He said he hopes to be able to bring inspectors to high-risk facilities as early as next week. "That puts our food supply at risk," Sarah Sorscher with the Center for Science in the Public Interest says in a statement. "Regular inspections, which help stop foodborne illness before people get sick, are vital." The Department of Agriculture has announced it will continue to fund SNAP (food stamps) through February. The USDA says it can keep paying SNAP benefits up to 30 days beyond the expiration of the most recent government funding resolution. That means SNAP recipients will actually get their February benefits early, on or before that spending authority expires on Jan. 20. About 1 in 10 Americans relies at least partly on SNAP benefits to buy food. The USDA's other major nutrition assistance programs have enough funding to continue operations into February. Climate scientists from all over the world are meeting in Vancouver this month, as the lead authors of the next international climate science report. But at least seven U.S. climate scientists who were supposed to help write it aren't there — scientists for NOAA, NASA and other federal agencies can't work or travel for work because of the shutdown. Air-quality monitoring is also affected: The Environmental Protection Agency manages sensors all over the country that detect various kinds of air pollution, such as ozone, industrial chemicals and smog. Usually, this data is released to the public right away, but because the EPA isn't operating at full strength, that's not happening. Air sensors run by state agencies and private institutions are still working, however. While the other branches of the military are part of the Defense Department, the Coast Guard falls under Homeland Security. After some maneuvering, the government found a way to pay its military members on Dec. 31. The nearly 42,000 active duty members of the Coast Guard are still working, as they are considered essential personnel, but it's not clear whether they will get a paycheck on Jan. 15. Former Coast Guard Commandant Thad Allen described a wide range of operations that continue during the shutdown: search and rescues along the nation's coastlines, efforts to stop drug smugglers, even the piloting of an icebreaker to Antarctica to break the ice around McMurdo Station. "I think it's pretty bad," Allen told NPR. "I think when you have people providing emergency services to this country without pay, I think we ought to take a serious look at how we're governed." The shutdown has meant that 2,295 of the Bureau of Indian Affairs' 4,057 employees are subject to furlough. Phone calls to the bureau go unanswered. The Indian Health Service, which is funded by Interior, provides health services for approximately 2.2 million of the nation's estimated 3.7 million American Indians and Alaska Natives. Most of its funds are appropriated for Native Americans who live on or near reservations in the western U.S., though some funding goes to those who live in urban areas. And the IHS is being hit especially hard by the lapse in funding. As NPR has reported, its only services that can continue are those that meet "immediate needs of the patients, medical staff, and medical facilities." IHS clinics are open during the shutdown and many staffers are reporting for work because they're considered essential, but they aren't being paid. Grants to support tribal health programs and preventive health clinics are currently suspended. The country's immigration courts are closed, and they already had a huge backlog even before the shutdown. Member station KPCC/LAist reported last month that Los Angeles alone had fewer than 40 judges and nearly 74,000 pending cases. With the courts now closed, the people who were due in court have their cases moved to the back of the line and must have them rescheduled, which could add two or three years to their wait. "It's not like when we come back, we can absorb the cases," Judge A. Ashley Tabaddor, president of the National Association of Immigration Judges, told KPCC/LAist. "There's no magical way to tell thousands of people to just come to their court hearings two weeks later so that the ones that were not heard can be heard." The shutdown has also halted E-Verify, a federal program that aims to prevent immigrants from working in the U.S. illegally. "There's an irony there," Julie Pace, an attorney specializing in employment and immigration law at the Cavanagh Law Firm in Phoenix, told NPR. "We have an electronic wall for E-Verify that should be being used, that the government has not funded." The federal judiciary continues to operate during the shutdown, using court fee balances and other funds. Its employees are reporting to work and remain fully paid, and it estimates it has enough money to sustain paid operations until Jan. 18. If the funds run out before new appropriations are received, "essential work" in the federal courts will continue. "Each court would determine the staff necessary to support its mission critical work," the judiciary said in a statement on Jan. 7. "In response to requests by the Department of Justice, some federal courts have issued orders suspending, postponing, or holding in abeyance civil cases in which the government is a party for a limited period, subject to further consideration, or until appropriated funds become available." Criminal cases are expected to continue without interruption. After staying open for the first few days of the shutdown, the museums and institutions that make up the Smithsonian have all closed. The National Endowment for the Arts says it will honor its fiscal year 2019 grants and that it's currently accepting applications for 2020, though during the shutdown, nobody is working at the agency to answer any questions. And some arts organizations receive federal grants on a reimbursement basis, which means they aren't sure when they will get back the money they paid upfront. "As you can imagine, any nonprofit cultural organization struggles with cash flow, as they really need to expend funds before funds are received," Dorothy Ryan, managing director of Brooklyn theater company Theatre for a New Audience, told NPR. "And the question about when the National Endowment for the Arts will be distributing funds really hits home for us." With rangers furloughed, people have driven off-road and defaced trees at Joshua Tree National Park in California. Sections of the park had to be closed temporarily, as seen here last Friday. Many national parks have stayed open through the shutdown, though without staff or servicing. While in some places other parties have stepped in to help — state or local governments, tourist bureaus, or volunteer groups — not all is well. Two weeks into the shutdown, NPS announced it will dip into entrance fee funds to pay for staff and service at some parks — an unprecedented and controversial move, as entrance fees are earmarked for visitor services, not operations and basic maintenance. At California's Joshua Tree National Park, which has stayed open without rangers, visitors drove off-road through parkland, creating new, unsanctioned roads, and destroyed some of the park's Joshua trees. After first saying the park would close on Jan. 10, the NPS reversed course and announced that by using fee revenue, Joshua Tree will remain open with additional staff to deal with sanitation issues and protection of park resources. 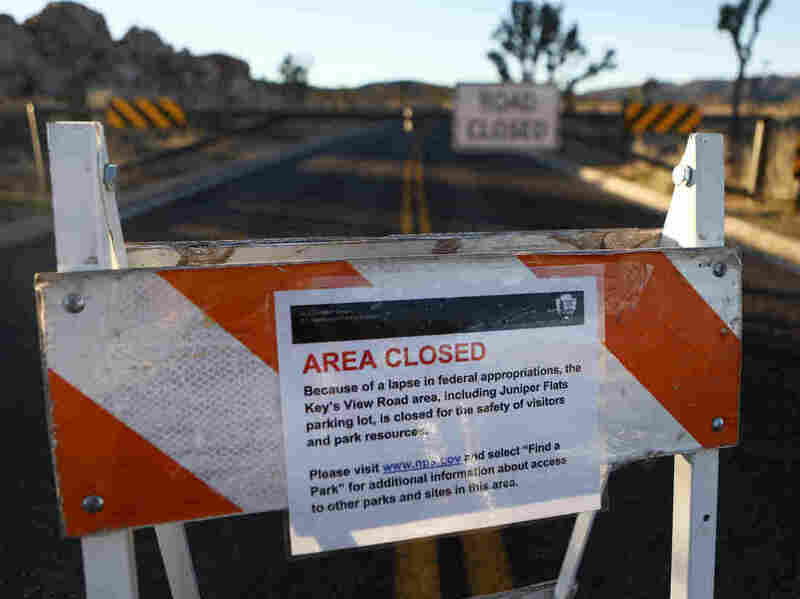 Former NPS Director Jonathan Jarvis believes the national parks have been kept open to avoid the public outcry that occurred over their closure during the 2013 shutdown. In an opinion piece for The Guardian, he warns of an array of ugly consequences of leaving the parks open: human waste in waterways, overflowing trash attracting wildlife and increasing human/bear encounters, poaching, artifact theft, and damage to fragile natural features. One site where you can find NPS rangers during the shutdown? The tower of the Old Post Office – the building leased to the Trump International Hotel. The building is owned by the General Services Administration. As NPR reports, the rangers were furloughed when the shutdown began. But then the GSA found some money to pay their salary, and the rangers returned. Rep. Betty McCollum, incoming chair of a House subcommittee that oversees the NPS, told NPR that she has a lot of questions about the arrangement: "The fact that it's a short-term agreement, the fact that it was a scramble to do it during a government shutdown, just has all the makings of, you know, why did this happen? Is it legal? Is it ethical?" The oil and gas business is booming, but much of that drilling is on federal lands and operators worry about a slowdown, Cooper McKim of Wyoming Public Media reports. The Bureau of Land Management says it is still processing online applications to drill; however, it's not clear what's actually happening with those. "Companies are waiting for leases," said Kathleen Sgamma of the Western Energy Alliance, a group of oil and gas companies. "If you don't have the full lease hold, it's hard to do the exploratory work or full development work you're planning on." That could be significant in Wyoming, where taxes from oil and gas make up a third of state revenue. More oil and gas lease sales are slated for February and March, but some in the industry worry that if the shutdown drags on, they won't happen. One place the shutdown isn't slowing proposed drilling projects is Alaska. BLM is moving ahead with holding public meetings about oil and gas drilling leasing in the Arctic National Wildlife Refuge, Alaska Public Media reports. The bureau is part of Interior, one of the departments affected by the shutdown. Raúl Grijalva, the Democratic chairman of the House Committee on Natural Resources, wrote a letter to the acting secretary of the Interior, asking how these hearings are happening "while so many other essential services remain shut down." BLM told Alaska Public Media that it's using funds from the previous fiscal year to continue working. The federal government is also the largest customer of DC Water — and it told the utility company it wouldn't be paying $5 million of its quarterly bill during the shutdown, WAMU's Jacob Fenston reports. The DC Water board members joked about how to handle this big unpaid bill, perhaps by turning off the water at 1600 Pennsylvania Ave.
"Water is leverage," says DC Water spokesperson Vincent Morris. "No one wants to go without it." Colin Dwyer, Elizabeth Blair, Greg Myre, David Schaper, Rhitu Chatterjee, Philip Ewing, Dan Charles, Joel Rose, Rebecca Hersher, Cooper McKim, Ian Stewart, Marisa Peñaloza, Peter Overby, and Shefali Luthra contributed to this report. A previous version of this story incorrectly called the TSA the Transportation Safety Administration. It is the Transportation Security Administration.